I have heard a lot of carpet and upholstery cleaners struggle with getting their jobs dry quickly when Summer arrives here in sunny old Liverpool. 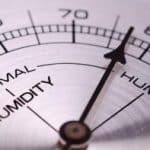 At least the problem of high humidity only lasts a short period of time, there can be a problem with getting carpets dry at this time of year. 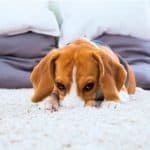 Usually, the problem in question is raised by a customer calling to say the carpet that was recently cleaned has started to whiff. This is caused by the high humidity in the air. The air in the room with the freshly cleaned carpet simply cannot absorb any of the moisture from the carpet. After just a short while it is possible for a growth of mildew to start to make themselves at home in the fluffy pile. As this mildew grows, it gives off a gas, this is what creates the smell. So if a customer calls a carpet cleaner back, some will get all gung-ho and re-clean the carpet. Maybe add even more moisture to the mix with an added deodouriser. But this is not best practice. The mildew in the carpet will eat up this moisture and will multiply, and more gas will be expelled. How do we get around this problem? Well, there are a couple of things to do. When cleaning (at any time of the year), moisture should be kept to a minimum as standard. A good pre-vacuum will remove a lot of the soiling in the carpet so we are onto a head start straight away. 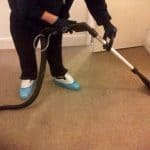 If the equipment is available to the carpet cleaner, and the carpet is a good choice – use a low moisture method, such as Dry Fusion or Thermadry. 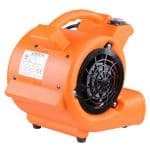 Once the carpet is clean, use air movers. Snail-type blowers are good, but in my opinion, Dripods are better.